What are good questions to ask in a network survey? 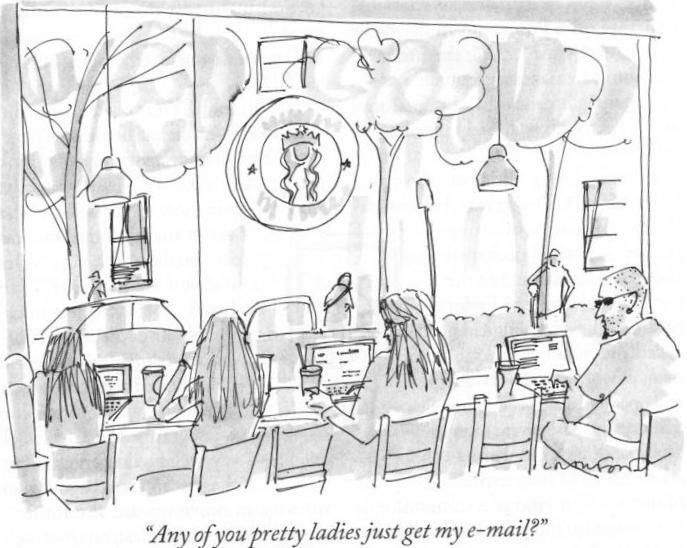 That is the burning question in the new ONA community of practice. We'll discuss that topic in depth, early in tomorrow's Jump Start Call #3. 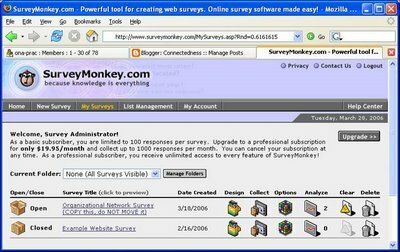 Then we'll talk about how to administer a network survey--including the cheapest and easiest way that I know, which is to copy and adapt this free ONA online network survey template hosted by SurveyMonkey (accessible under account "ona@connectiveassociates.com" with password "ona"). Then I'll spend a bit of time on one of my favorite topics, network visualization, and encourage listeners to go beyond "plate of spaghetti" pictures and create images with story-telling power: And we'll end with a rich discussion about what action to take after the organizational network analysis is done, and it's time to do something about it. LinkedIn has taken a huge leap forward with its new Outlook toolbar, which features a dashboard that integrates desktop email and online social networks more tightly than ever. Below you can see LinkedIn acting inside my Outlook window to provide Keep-in-Touch Reminders, Contacts to Invite, and Contact Updates. Even more ambitiously, LinkedIn suggests emails I should consider replying to and, coolest of all, important emails I have sent to people that need additional follow up. I tip my cap to LinkedIn for putting such a useful dashboard inside Outlook. 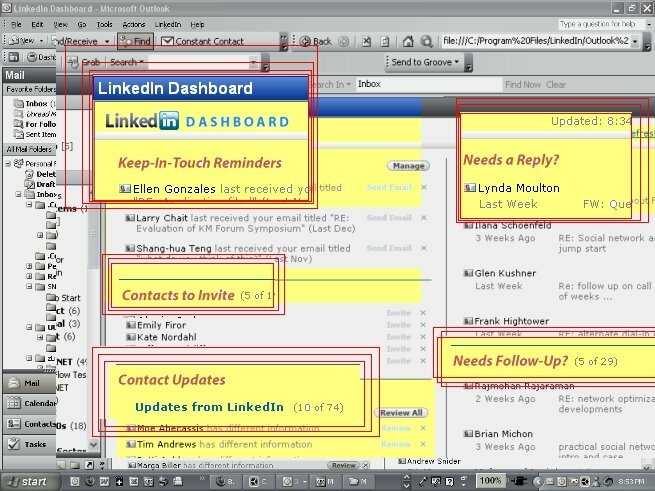 Even though I still think LinkedIn's most famous feature (introducing people) is dubious, I can tell I will rely increasingly on LinkedIn's Outlook toolbar to help me manage my address book and email. Today I sat in with Kate Ehrlich and Don Ronchi as they shared their SNA experiences on our second of four Jump Start calls. Late in the call, Don explained that people create and navigate social networks best when the process is driven by the search for value. Nice. There. Did you notice what just happened? Just by thinking about bridging vs. bonding, you increased your power to win resources, achieve impact, and increase profits. 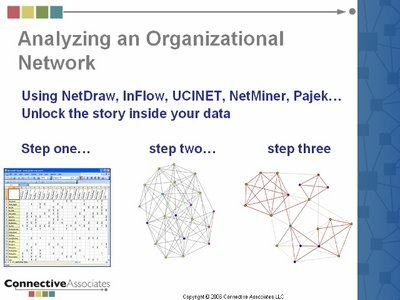 As Burt and Ronchi point out, their research shows that businesses can use the network perspective to improve performance even without investing in a single network survey or organizational map. My favorite part of Burt and Ronchi's paper is their reference to the work of Janicik and Larrick, who studied how well people learn "who knows whom" in an organization. It turns out we expect our friends to know each other, and we have a hard time remembering which of our friends don't know each other. In other words, we aren't very good at recognizing bridging opportunities (aka "structural holes"), and hence we miss out all the time on chances for innovation and profit. The good news from Janicik and Larrick is that people can learn to recognize structural holes. Surprisingly, even a little learning goes a long way in this regard. Just listening to conversation about structural holes can boost by 25% a person's ability to recognize them in real life. Now that is a conversation worth listening to! You don't even have to wait for the conversation to happen. You can start it yourself. 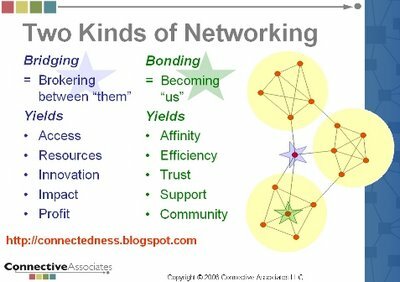 To make it easier for you, I have posted the above "Two Kinds of Networking" image as a print-it-yourself business card. Just print the PDF on Avery 8877 (or compatible) stock and you'll have social capital cards to help you and your colleagues make the most of your networking. 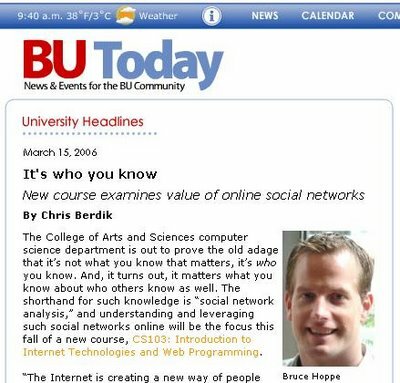 Boston University announced today a new course in the Department of Computer Science about online social networks: You can read the entire article in BU Today here and see my embryonic course website here. 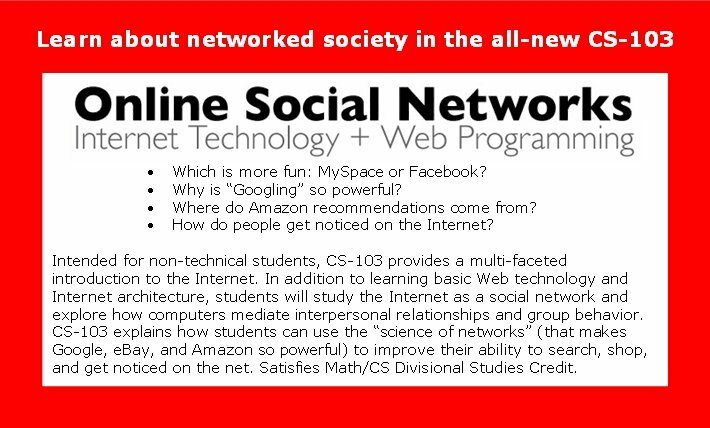 I am really looking forward to teaching this class, which I got to design from the ground up. Of course, I didn't really design it from the ground up. 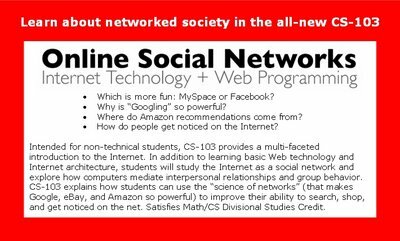 I got all kinds of good ideas from my colleagues, most notably Jon Kleinberg (the MacArthur genius who teaches Structure of Information Networks at Cornell), Michael Kearns (who teaches Networked Life at UPenn), and Brian Linard (who teaches Effective Use of the World Wide Web at UC Riverside). 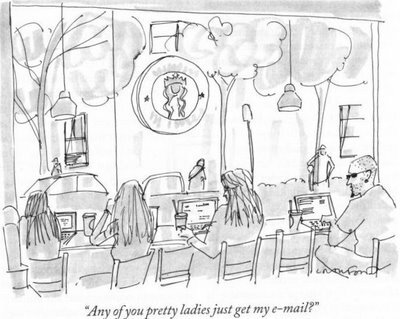 Yesterday's NY Times Magazine featured the story, "Can network theory thwart terrorists?" I like the concluding paragraph, which says in so many words, "probably not." But network theory certainly can help us understand how terrorists continue to organize successfully against the US even when our military is doing a fair job of downsizing the terrorist leadership hierarchy. The story also suggests how network theory underlies the disputed US goverment wiretapping of its own citizens without court approval. When wiretapping involves not focused surveillance of one person, but superficial monitoring of huge numbers of people (similar to Enronic), what does court approval mean, exactly? 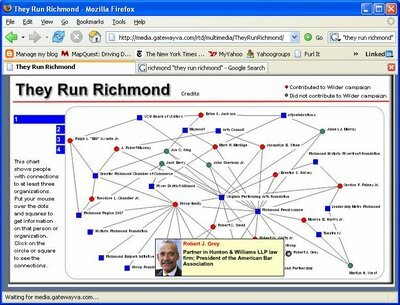 Thanks to Marion Kane of the Barr Foundation for pointing me to "They Run Richmond," a story about the power brokers of Richmond, VA. 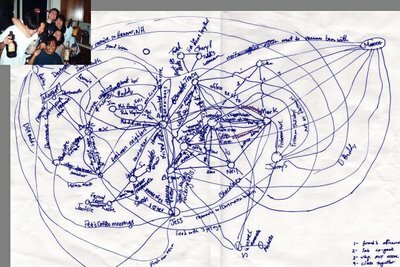 The story features a fun interactive network map of people (circles) and organizations (squares): The network map (which the paper calls a "spider chart" and a "smashed windshield") entirely omits links between people, instead connecting them only via shared organizational affiliations. That's an implicit nod to how most relationships arise from circles, a phenomenon discussed in this post about "How to build your network."